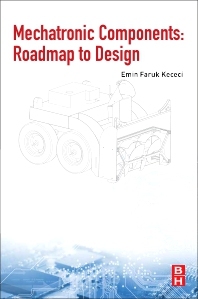 Mechatronic Components: Roadmap to Design explains the practical application of mechatronics, including sections on adaptive structures, robotics and other areas where mechanics and electronics converge. Professional engineers in a variety of areas will find this textbook to be extremely helpful with its in-depth use of flow diagrams and schemes that help readers understand the logic behind the design of such systems. Using approximately 130 different components with diagrams and flowcharts that help engineers from different fields understand the general properties and selection criteria of a component, this book presents a comprehensive resource on mechatronic components. Professor of Mechatronics at the Department of Mechanical Engineering at Abdullah Gul University, Kayseri, Turkey. Dr. Kececi received his BS and MS in Mechanical Engineering from ITU and Duke University in 1996 and 1999 respectively and he received his PhD in Electrical Engineering from University of Virginia in 2003. His current research focuses on mobile robots and medical robotics as well as directing the AGU-MAKE, Maker Space. Dr. Kececi has edited 2 books in 2015 which are published by ASME, titled as Mobile Robots for Dynamic Environments and Design and Prototypes of Mobile Robots. Dr. Kececi also served as a member of the Editorial Board of Robotica. Affiliations and Expertise Professor of Mechatronics, Department of Mechanical Engineering, Abdullah Gul University, Kayseri, Turkey. Robotics, mechatronics, machine design and controls.